Rabbi Yitzhak Yosef attacks religious judges and teachers who use cell phones with unfiltered internet access. Israel's Chief Sephardic Rabbi, Rabbi Yitzhak Yosef, stressed in a speech Sunday that the use of cell phones inhibits Torah study. Rabbi Yosef said that he does not go around with a cell phone on himself, because the routine use of cell phones causes “bitul Torah” – a term that refers to wasting one's time on idle matters instead of studying Torah. He spoke sharply against religious judges (dayanim) and halakha-interpreting rabbis (morei hora'a), who hold cell phones thathave unfiltered internet access. He warned dayanim who are thinking of showing up at a conference of dayanim with an unfiltered cell phone in their pocket – to think again. 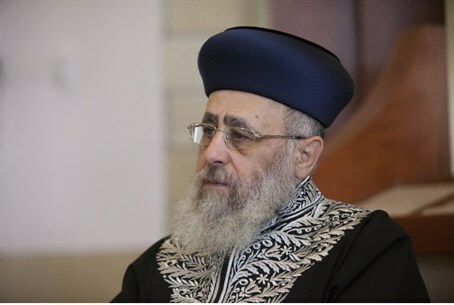 Rabbi Yosef also implored heads of kollel yeshivas to promulgate an instruction forbidding students from entering the kollel with a cell phone on them – or at least turn off the phone while they are studying at the Beit Midrash, or study hall.